There exists a very rich biodiversity in the Ribeira Sacra region. 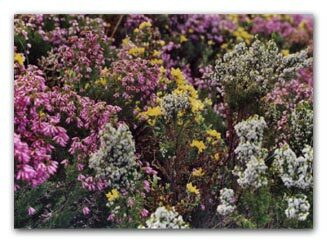 The area has an atlantic-continental climate with all that this implies – e. g. chestnut trees, oaks, heather, gorse and broom. However in addition to this atlantic-continental flora, a large variety of Mediterranean plants can also be found due to a special microclimate in the river SilCanyon. These include cork oaks, holm oaks, olive trees, orange trees and lavender. A significant number of medicinal plants can also be found like yarrow, marjoram, St. John's Wort, etc. not forgetting the blueberries, blackberries, wild strawberries, rose and elderberries. And if the flora is exceptionally varied the fauna does not disappoint. In the woods of The Ribeira Sacra hide foxes, roe deer, wild boar, rabbits and badgers. Various species of eagle, kites, herons and ducks make their mark in the skies. In the water of the river Sil trout, carp, black-bass and otters are in their element. Following a study more than 160 vertebrates can be found in the Ribeira Sacra.